Five of Cups Tarot Card Meaning - All Explained HERE! The Five of Cups is the fifth card of the Cups suit. Taking a darker outlook, the Five of Cups is not a pleasant card. The central character, clad in black faces three overturned cups, representing failure. Behind him are two upright ones. There is a certain positive aspect, not all is lost, but right now he is failing to see it. 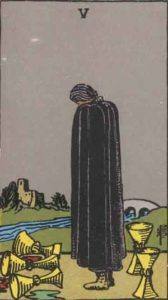 The Five of Cups represents disappointment and a sorrowful nostalgia. Past – The Five of Cups in the Past position can mean that you are still thinking over something bad that has happened, possibly a long time ago. We frequently reach forks in the road of life and you may be feeling that one specific one has taken you the wrong way. It’s a dangerous business, walking. You step onto the road, and if you don’t keep your feet, there’s no knowing where you might be swept off to. In life, we often make mistakes but fail to see the lessons we learn from them. Good and bad experiences have the same value. Bad experiences teach us lessons so they are not repeated. Good experiences reward us for our good choices. Present – The Five of Cups in the present position means you may currently being going through a stressful period of your life. There might be some highly charged emotions being thrown around and you’re focusing on the negative or worst possible outcome. Think of the hidden benefits that are currently being overshadowed by events. Every cloud has a silver lining, no matter how dark or stormy it might seem. Bad things happen to us all, but they end, and we know this. This isn’t to say you should be flippant with how you react, learn, live and grow. Future – The Five of Cups in the future position suggests a period of time in the future when you’re going to regret what has happened. Are you currently consciously doing something wrong? You will regret it. Are you unsure about an upcoming decision? Think about it more and get some more opinions. Work / Education – The Five of Cups in regards to work or education means things might not be going well in either of these areas. Don’t worry, we can’t have good without bad. If you’re working too much, try to focus on what you’re good at instead of managing the whole situation. If you’re looking for work, ask people you already know. It might not be the right time to ‘go for it’ if you have a big decision to make. Romance – The Five of Cups in romance is a not a good sign. Things are taking a downward turn. You need to give yourself time to analyse the situation fully. Are you at fault? You can’t do worse than telling the truth. Is it your partner? You might need to think about the relationship as a whole and see if it can continue further. Remember that saints need sinners. Good implies bad. Friends – The Five of Cups in regards to friendship means there might be a fracture in your friendships and arguments. A definite split might prompt you to feel the need to choose between two groups. If it’s nothing to do with you, follow your own feelings. It might even be slightly beneficial to stay with one group and shun the other. Money – The Five of Cups in regards to finances reminds you to focus on what you have instead of what you don’t have. Every day we’re bombarded with an ideal lifestyle, which is something that nobody lives. Advertisements and TV shows, even social media give off an image that everyone else is living a better life than you. Live within your means. True wealth is not measured by what you have, but by what you can give. Health – The Five of Cups can highlight potential negative thought patterns you’re having. Are you a pessimist? Sometimes we can’t change the way we think, but we can understand why we think them. There is all sorts of advice around saying you should keep a positive attitude. You don’t have to. Just don’t be overly negative. Understand that there is good and bad and they both happen to everybody. Try not to think about the past obsessively. It’s helpful to think about bad events and learn from them. Physically, don’t comfort yourself with food and bad food. In the short term it can help, but only because it is an animal instinct. To conquer the past, you have to understand it. Spirituality and Mentality – The Five of Cups in spirituality is a strong placement, as the past cannot be changed and remains solid. It’s good to think about the present as an expression of the past, and how you mould the present is what will affect the future. You can draw into yourself good future events if you take the time to understand what triggers them. You might feel that you have less than you normally do. Even so, try giving a little more. In reverse, the Five of Cups signals the understanding of the card. You are seeing things from a different angle. A recent event in your life has likely changed the way you live, and you’re now coming to terms with it. You might be recovering from a breakup, or the loss of a loved one. It can also represent a mistake you have made, which you are starting to forgive yourself for. We can’t hold on to things which hold us back in life, even if we were at fault. Make things right, then learn to forgive yourself. Five represents energy, unpredictability and change. Five has a grand occult tradition; Pentacles and the five Chinese elements. The Five of Cups reminds you to think back to ‘the good old days’ with respect but not sorrow. Those times happened and there are better ones ahead. If you’re feeling down now, remember the rule of impermanence. Nothing at all lasts forever, not even the bad times. If you have many fives in a reading, it gives off a strong message that you’re in for some change very soon. We’ve selected live tarot readers to give you a FREE 3 Minute interpretation of The Five of Cups! Scroll through them below and pick your favorite one.